Apparition Lit is a toddler-aged speculative fiction magazine. Each quarter we open for submissions based on a chosen theme and curate stories and poems that meet, or challenge, that theme. We love speculative fiction. It’s weird, almost unclassifiable. It’s fantasy, sci-fi, horror, and literary-- all those good things that make life a little more special and magical. We want to bring you the best stories possible and pay livable wages. If you can’t afford to donate to our Patreon or become a yearly subscriber, you can support us by following our social media accounts or purchasing individual issues. Every little bit helps. All donated funds go toward the maintenance of the website and paying our featured authors and artists. With the launch of our Patreon, we’re excited to give away soft-enamel pins and stickers to everyone at the $4 tier and up. If you miss the giveaway, you can still sign up at the ($10) Crusty Fouler level and receive some sweet sweet stickers (and a few other perks)! First is our signature sassy barnacle with a white background and teal border. This circular pin is perfect for preparing polished prose or blinding your enemies with its dazzling brilliance. 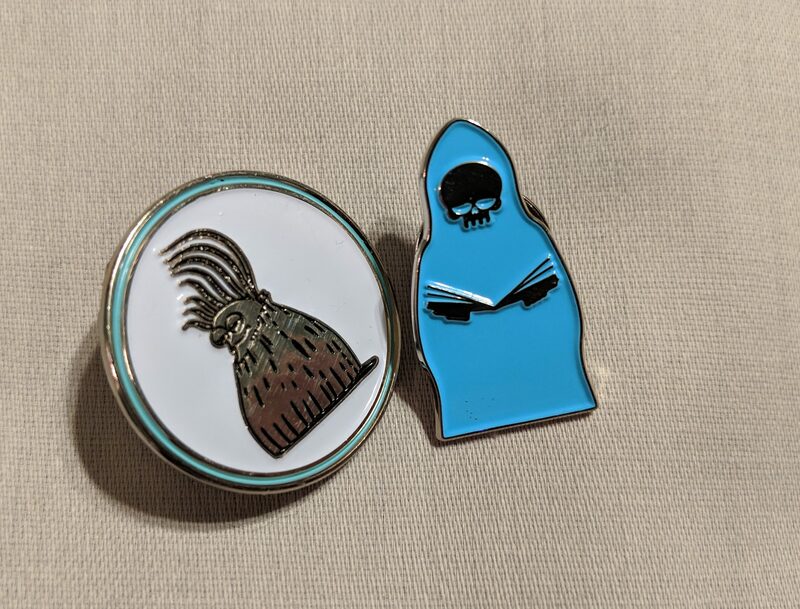 The second pin is our too-blue-for-you ghosty, who just wants to be left alone with a good book. No, they don't want to tell you what it's about. No, they don't care if you already read it and have opinions. Their opinion is that you outta move three seats over sir. 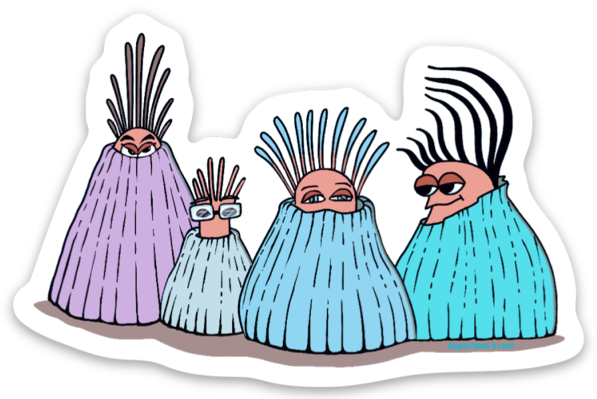 Sign up at the Crusty Fouler level or above and you'll get some barnacle friends who are happy to watch you work and cheer you on. When we launched our magazine we were immediately astounded by the support we received and the quality of the work we’ve published. Our authors and artists are like family to us. From the very beginning, we wanted to treat authors the way that we wish magazines had treated us. This meant an open and transparent submissions process (you can read up on the stats of each submission call in our newsletter or on our Patreon), on-time contracts and payments, and a loyal hype-machine. Although we ask for non-simultaneous submissions, Apparition Lit has a quick turnaround time, earning us a listing on Duotrope’s Top 100 Fastest to Respond for both short stories and poetry. We generally take 2-4 days to respond with a yay or nay, leaving you plenty of time to polish your manuscript or resend out on the submission train. For each story and poem we publish, we create an image featuring a line from the work. We spread love and hype for our authors on Twitter and Facebook. We want to give professional attention to our authors, even if we’re not yet able to pay them professional rates. In 2019, we’ve increased our pay rate to $0.03/word for short stories and $15 flat rate for poetry. From our launch in October 2017, we received incredible contributions from donors and subscribers. The support of our donors and subscribers have directly contributed to our ability to commission original artwork and raise our pay rate. Apparition Lit has always tried to maintain a personal policy of openness and accountability, especially in regard to the management of our magazine. Below are our anticipated fees for 2019, which set the minimum support we need to keep the magazine afloat without editor payments buoying us. Although we love our magazine and are always ready to chip in, our ultimate goal is to see Apparition Lit stand on its own feet (however many limbs it needs), so that there will come a time that new editors could step forward without the obligation of deep pockets. Apparition Lit’s goals for 2019 and beyond still include these editor payments and instead focus on increasing author payments and adding more original artwork to the magazine. We want to pay you before we stop paying in. Once we hit $600 a month, we'll become a pro-rate magazine! You're just the cutest little baby arthropod we ever did see, yes you are. We shall raise you as our own. Thank you! You'll be included in the credits for each issue, since you helped bring it about (unless you don't want your name/alias listed)! You'll also automatically get an email subscription of our magazine. Let's take this symbiotic/semi-parasitic relationship to the next level. You get access to our private Slack channel, where we discuss books, TV, and other media! Plus you get everything a Larva Barnacle gets! Not even the most powerful enchanted pressure washer could pry you from our hull. Your chitin is looking a little naked. How about a sticker? Annnnd, how about another perk? You get four Hall Passes to use throughout the year! These Hall Passes have magical powers. Each individual Hall Pass gives you an extra day in the submission periods, meaning you can submit a day early or late. OR you can combine the powers of the Hall Pass to create a Resubmission Ticket. If we’ve rejected a story but you think it still fits a theme, use the four Hall Passes to resend a revised manuscript. Plus everything from the lower tiers! A delicacy in some Earth cultures, you look like a dinosaur toe, which makes humans want to eat you. But we won't eat you. You're safe here. Once per quarter, you'll receive a 250-word critique about our immediate reactions to a submitted story and, if it was rejected from one of our submission calls, details on why we decided not to publish. Plus everything from the lower tiers! Your natural, phosphoprotein adhesive is most impressive. Once a month you can submit a story (up to 5k words) to be critiqued by one of our editors. You will receive a 250-word critique focusing on story flow and questions the editor had while reading. The editor will also make suggestions for polishing the story. Plus everything from the lower tiers! Beneath a craggy exoskeleton you hide your tender, squishy innards. Also legs. Barnacles have legs. Once a month you can submit a story (up to 5k words) to be critiqued by all four of our editors. You will receive a 250-word critique from each editor focusing on story flow and questions the editor had while reading. The editors will also make suggestions for polishing the story. Plus everything from the lower tiers! Apparition Lit is able to cover all author and artists fees (set at $0.03/word for short fiction, $15 for poetry, and $130 for commissioned artwork). Editor payments cover all maintenance and business related expenses.